If you cannot find a clean, suitable barrel, or if you want a small smoker with a little more control, you can build a versatile smoke box in a few hours. Make it larger than a barrel for the increased capacity. A 4' x 3' box smoker is a convenient size that can take 6-8 hams at once, but you can vary the dimensions to suit your needs. This box smoker is made from materials readily available from any lumberyard. 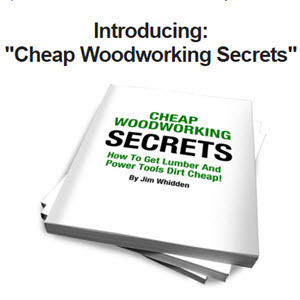 To cut costs, you can use rough-cut boards or lumber from wooden shipping pallets. Figure 3. A box smoker can cold smoke twice as much as a barrel smoker. 1. To build the back of the smoke box, cut nine 1 x 6s to 461/T. Cut two 2 x 3s to 49M". Lay the two 2 x 3s on a flat surface parallel to each other and 41/-2" apart. Between these, align the first 1 x 6 on top, flush with the sides and ends of the 2 x 3s. Nail the 1 x 6 into place with two 6d nails. Position the second 1 x 6 edge to edge with the first 1 x 6. Align the ends with the outside edges of the 2 x 3s and nail into place. Continue until the nine boards have been nailed into the 2 x 3 corner supports. Set aside. 2. For each of the two sides, you will need nine 1 x 6 x 341/2" pieces and one 2 x 3 x 491/2" length. Lay the 2 x 3 on a flat surface. Perpendicular to it, align the first 1 x 6 with the end and outside edge of the 2 x 3. Nail together with two 6d nails. 3. 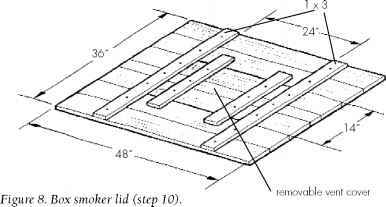 There will be runners along the top edge of each side to which the lid will later be nailed. Cut two 29%" lengths from the 2 x 3 stock. Lay one of the sides flat on a work surface with the corner support facing down. Slip one length of 2 x 3 under the side so that it butts against and is perpendicular to the corner support. It also should be flush with the outside edge of the end board. Nail into place. Follow the same procedure for the second side. Cut one 2 x 3 to 41M". This runner will be nailed between the two back corner supports in the same manner. 4. Cut two hanger rack support boards to 29M" from the 1 x 4 stock. Lay one of the pieces on a flat work surface. Measure in 7" from one edge and mark for a slot 1/4" wide and 2" deep. From the edge of the slot, measure in 6" and mark for a second slot. The third slot will also be separated by 6". This will leave 7" at the end of the board. Saw along both sides of the slots to the 2" depth. With a chisel and hammer, chisel out the waste wood. Figure 6. Attaching the hanger racks to the side walls (step 5). Figure 7. Box assembly (steps 7, 8, and 9). the screw holes so that the wood doesn't split. 6. Turn the back on edge so that it rests on one of the corner supports. Set one of the sides at right angles so that the sawn ends are flush with the outside of the back. Approximately 1W in from the edge, nail each side board into the back corner support with two 6d nails per board. 7. Rotate the box so that the side rests on your work surface. Set the second side in place with its sawn ends flush with the outside of the back. Be sure the runners for the lid are opposite each other. Nail through the side boards into the back corner support. You should now have a three-sided box with 2 x 3 supports in each corner. Set the box aside. 8. For the door frame, cut two 2 x 3s to 48" and two to 44M". Rest one of the 48" lengths on edge. Into it, toenail the shorter uprights, one at either end, using 8d nails. Lay the second 48" length on edge. Tip up the U-shaped 2 x 3s so that the shorter uprights can be toenailed into the bottom cross rail. so that the top and bottom cross rails align with the outside edges of the sides. Measure in 1/8" along the uprights and nail the frame to the corner supports with 10d nails. 10. 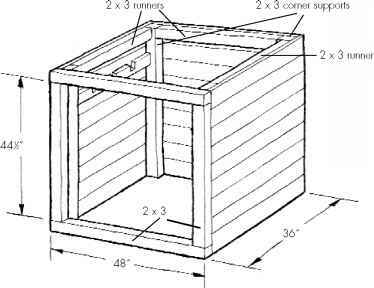 The box smoker will have a cover and a movable vent cover. For the cover, cut four pieces of 1 x 6 to 48". Cut six pieces to 12", and rip two of these to 3" wide. Also cut two 1 x 3 x 36" lengths for the cleats. On a flat surface, lay out the pieces so that the ends of three 12" lengths are 24" from the other three 12" lengths. (In each set of three there should be one of the 3" x 12" boards.) To the top and bottom of these, place two 48" lengths. There will be a 24" x 14" hole in the center for the vent. To either side of the vent opening, place a 1 x 3 cleat. They should run perpendicular to the cover boards. Nail through the cleats into the lid boards with 4d nails. On the underside of the lid, bend over the nails with your hammer. 11. Place the lid on top of the box. Along the sides and back, measure in 1^" and nail the lid to the box corner supports and runners with 6d nails. Along the front, measure in %" and nail the lid down with 6d nails. with 6d nails. On the underside, bend the nails over with your hammer. 13. Cut eight 1 x 6 boards to 441A" lengths for the door. Rip one of the eight to 4XA" wide. Then cut two 1 x 3 boards to 42" long. Lay the 1 x 6s edge to edge on a flat surface. Place the two 1 x 3 battens for the Z-brace perpendicular to the 1 x 6s, and 24" apart from inside edge to inside edge. Be sure they are centered on the door. Screw them into the 1 x 6s with r^" wood screws. Each board should be screwed top and bottom into the battens. 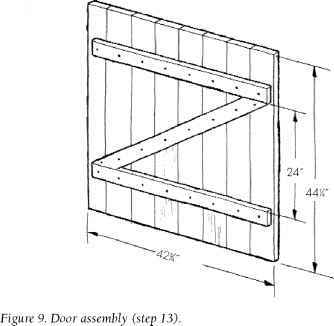 Measure for the 1 x 3 diagonal brace between the battens (approximately 48") and screw it into the vertical door boards. 14. Hang the door using the hinges, spaced about 5" from the top and bottom of the door. Screw into place and lift the door into the opening. ceive the hinge plate. Replace the door and fasten the hinges to the frame. Check that the door swings freely. 15. Close the door. At a convenient height, screw an eye to the door frame and a hook to the door. This allows you to latch the door tightly. 16. 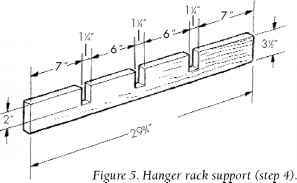 Cut two hanger racks to 461/4" from 1 x 3 stock. They should fit between the slotted supports. Drill M" holes 6" apart and at a slight upward angle for the dowels. Cut 3" dowel lengths and pound them gently but firmly into place. 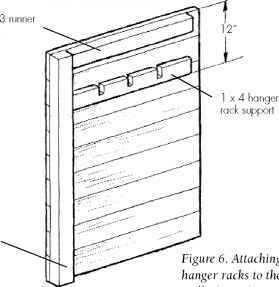 Set the hanger racks into the slotted supports. Now the box smoker is ready to be positioned. 17. Locate the box smoker uphill from the fire pit. 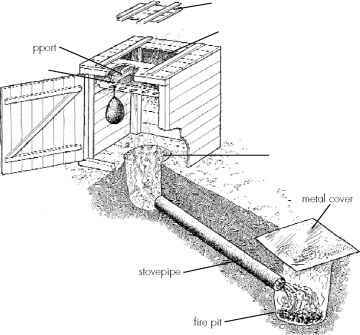 Dig a smoke hole, fire pit, and trench as for the barrel smoker. Place the smokepipe in the trench (or use drain tile or a board-covered trench) and cover with earth. Mound the earth around the base of the box smoker.